In the two months since my original article for The Asan Forum, TPP appears to have stalled. News reports of the most recent negotiating round, as well as US-Japan bilateral negotiations over agricultural products, suggest that there has been little if any progress since the December negotiations in Singapore. While this is a disappointment for TPP proponents, it is not exactly a surprise. In this, my final posting on this issue for The Asan Forum, I address the reasons for this situation and respond to Richard Katz’s critique of my original article. Despite the optimistic announcements and goals made along the way by negotiators from the United States and other participating countries, TPP has never been an easy undertaking. With twelve economies with widely varying economic systems, levels of development, and interest structures, not to mention dozens of chapters addressing “behind the border” issues, TPP is one of the most challenging trade negotiations in the world today. Any wager on quick success of TPP has always been a sucker’s bet, particularly as long as the USTR was negotiating without the backing of Trade Promotion Authority (TPA, see below). That said, any pronouncement that TPP is dead or that one side or another has killed the negotiations is premature. It is the nature of trade agreements that the most difficult issues are not decided until the very end; unless negotiators actually believe that the very end is actually approaching, they will not begin to offer concessions that will be unpopular among important domestic constituencies. To quote Yogi Berra, “It ain’t over till it’s over.” Despite the creation of multiple artificial “deadlines,” the only way for an outsider to know for sure that a negotiation is approaching its end is that major concessions are being made. Probably the greatest economic lure of TPP for most of its members is the promise of better access to US and Japanese markets; for this prize, they are willing to consider making important changes to their own economic and legal systems. An agreement between the United States and Japan as to what they expect from each other will not guarantee a successful TPP, but it is a necessary condition. Thus, my article focused on the US-Japan dynamics. The idea of a US-Japan FTA has been mooted since at least the late 1980s, although until recently it was dismissed by most observers as politically unfeasible. Japan was seen as committed to protecting the interests of a number of weak economic sectors (including not only agriculture, but also a variety of services and manufacturing niches), not to mention aspects of the “Japanese system” such as corporate governance and self-regulation that created effective barriers to foreign imports or investment. Meanwhile, US auto and auto parts producers remained implacably opposed to lowering barriers to imports from Japan. While the lure of opening Japan’s markets made its participation in the TPP attractive to partners, my statement in the original article that, “The inclusion of Japan increases the challenge for negotiators,” should be considered an understatement. With these clarifications in place, it is time to address the questions raised by the apparent stall in negotiations and by Katz’s critique. The key question to begin with is why negotiations appear stalled. Here, I think that the answer is simple: the US Congress has not passed (or even formally taken up discussion on) TPA, and there is little prospect of TPA being passed until after the November 2014 elections. Without TPA, the US government will not be able to guarantee that whatever it agrees to will be implemented as agreed with its TPP partners. Even if we assume that TPA will eventually be granted, it will contain a series of Congressional requests, demands, and expectations; other TPP governments understand that concessions now will be taken as the new starting line for US negotiators, as Congress will seek to use TPA to shift the goalposts further toward US demands. This does not mean the negotiation is dead, nor does it mean that tacit agreements of the “if-then” sort will not be agreed among subsets of negotiators. But it certainly means that the environment is not conducive to significant, public concessions by either US negotiators or their TPP counterparts. I understand that there has been a lot of questioning of how flexible the Japanese negotiators are being on agricultural and other issues, and Rick Katz’s response echoes this skepticism. While I agree with the empirical assessment, I am not willing to assign any meaning to it at this point, for the reasons detailed above. Japan’s negotiating behavior is consistent with both real intransigence and biding time. Until there is progress on (if not necessarily actual passage of) TPA, we just do not know. The rest of this response addresses the analysis of my original article regarding the Japanese government’s seriousness about using TPP as a tool of advancing domestic structural reform. Since it is impossible to know for sure why Japan has not made major concessions in the three months since the Singapore round established rough “landing zones” for the final agreement, we have to triangulate among three types of relevant data: rhetoric, TPP concessions made so far, and policy initiatives unrelated to TPP. While Katz and I are both working off the same types of data, we do have some real disagreements of interpretation. On the rhetorical level, I have already made the case that the Abe government had made a strong commitment to the success of TPP over the course of 2013, although it was tempered somewhat by the stated intention to protect the interests of five agricultural product areas. Katz assigns somewhat more importance to those agricultural caveats than I do, but I would point out that this is an unusually limited set of sacred cows for the Japanese government to be defending at this point in the negotiations. (It is also a shorter list than that of the US side, but that is a separate story.) Of course, my original article was written in January, and time moves on. During the last couple of months, I think that Katz is correct that the Abe government’s rhetorical commitment to TPP and real structural reform has been on the wane, as the administration’s attentions appear to have turned to matters of security and Japan’s colonial and wartime history. To the extent that we are hearing about TPP, it appears to be mostly about protecting the agricultural big five. To the extent that the Abe administration has always been torn between economic reformers and security-focused nationalists, it appears that the security-focused group is on the ascendancy. The second type of data is the concessions that Japan has already made in the TPP negotiations. 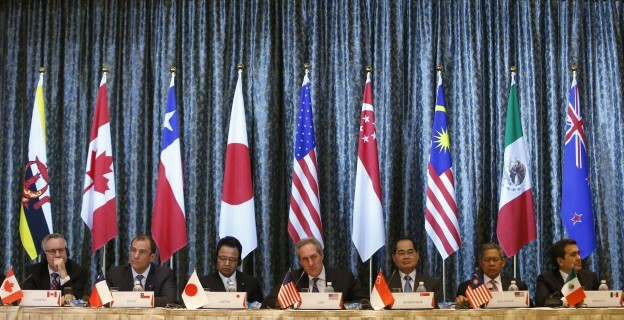 Given its late entry into the negotiations, Japan was required to make a variety of substantive concessions just to be allowed in: not only did it have to accept all previously-agreed points, but in its bilateral discussions with each of its TPP counterparts, it made a number of additional concessions. The best known of these is the understanding that it would accept that the United States would delay tariff reductions on automobiles until the end of the phase-in period. (There have been reports that Japanese negotiators feel that some of these concessions are not formal commitments, but I doubt that their US counterparts will accept any backtracking.) Katz and I disagree on the extent and importance of these concessions; since we have both made our cases, I will leave it to the reader to decide. Katz’s strongest argument is based on what the Japanese government has (or rather, has not) done in terms of implementing its non-TPP-related domestic structural reform agenda over the nine months since the first list of proposed policies was released in June 2013. On the surface, there has been some progress, with laws passed in the fall to change regulation of agricultural land, pharmaceutical sales, electricity reform, and an enhancement of the “special zones.” Katz is skeptical of these reforms. I do not know enough about either agriculture or electrical generation and transmission to question his dismissal of these two. I think he is a bit unfair regarding the reforms to pharmaceutical sales: while Rakuten’s Mikitani did publicly resign from the reform council in righteous—albeit self-interested—indignation, it was over the exclusion of a small number of over-the-counter medications from online sales. Still, online OTC pharmaceutical sales are minor when compared with the major reforms in labor laws, corporate governance rules, and others that I believe are most important for Japan’s economic renaissance. I would say the same of special zones. Meanwhile, the Japanese government has been nearly silent on new reforms in the months since I wrote my original article, while it has become increasingly embroiled in issues of security and historical memory. I still have my fingers crossed that more substantive reforms will emerge in the coming months, but I suspect that Katz may be right that the economic reformers in the Abe brain trust are being marginalized. TPP is potentially very important in advancing structural changes in Japan’s economy regardless. For example, two of the most significant market-distorting institutions in Japan are the Japan Agricultural Cooperatives (JA) and Japan Post’s financial services. Depending on the content and implementation of the competition chapter, their privileged positions might be significantly constrained. This is not one of the chapters that has been leaked, but the USTR fact sheet on TPP and the relevant US Chamber of Commerce position paper call for a strong set of standards. To my mind, this is the chapter that will provide the most important “behind the border” impact on Japan, and I expect that the USTR would not submit a TPP agreement to Congress that did not have strict competition disciplines. One final point that I would like to make, both about TPP and about my debate with Katz, is that he and I are not actually arguing about exactly the same thing. While both of us would like to see some significant changes in the Japanese economic system, my article was about TPP, not Abe’s “third arrow” in full. Katz is skeptical about the ambition of the Japanese government’s structural reform program, and I would further add that many of the things that he and I would most like to see changed in the Japanese economy result from corporate practice, shareholder expectations, and the like, and will not easily change even if formal policies and even laws are changed. However, for the TPP question, while forward motion—or lack thereof—with regard to domestic structural reforms is indicative of Japan’s commitment to change, it is not determinative of either the extent or type of concessions that Japan will be willing to make in TPP negotiations. I stand by my original conclusion that Japan needs a successful TPP more than the United States, that the United States has a different timetable and agenda than Japan, and that its inflexibility (coupled with difficulty of commitment) endangers or at least will significantly postpone the success of the whole TPP endeavor. Regardless of what happens with the rest of the third arrow reform agenda, this will slow the pace of overall structural reform in Japan, which is unfortunate.